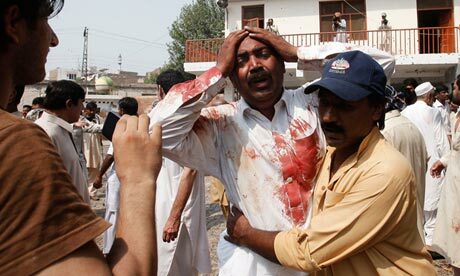 Past weeks have been a brought no relief from the rain of blood that continues to flood the streets of Pakistan. Maj Gen Sanaullah Niazi and Col Tauseef embraced shahadat following IED attack by Taliban militants. This was followed by suicide attack against a Christian Church that killed over 80 innocents. Immediate reactions from GHQ and the government condemned the attacks and promised that militants would not dictate to the country. As the smoke began to clear, though, the national mindset was once again in a fog and the confusion that has been a hallmark of our failure to face the militant threat remained blinding. PM responded to Sunday’s suicide bombing by declaring that peace talks cannot proceed as intended. For some, this may seem like the natural reaction to an enemy that attacks with impunity. Instead, though, the response was met with the denials and conspiracy theories that define our descent into madness. Hours after media reported statements of jihadi spokesman Ahmad Marwat terming Christians as ‘enemies of Islam’ and promising more attacks against non-Muslims in Pakistan, jihadi sympathisers took to social media to declare the attack a conspiracy. Some of this is the result of social inertia – the use of religion to support a certain foreign policy and a justification for the unconventional means to carry it out has worked itself deep into the national psyche. It is not just the awam who have been infected by the virus of extremism, however, it has spread into the deepest recesses of the military establishment. Cyril Almeida notes that there can be no coherent plan to address the Taliban threat because, despite the words of COAS and PM, those with the responsibility to carry out the defence of the nation are not in agreement. To build the case that the TTP is as bad as bad can get, the less-visible, more-powerful boys drew up a list of several thousand names. Against each name, a sponsor was listed: CIA, RAW, NDS, Mossad, etc. These folk aren’t Taliban, the case was made, they’re mercenaries, paid agents of the enemies of Pakistan. The real battle that has to be fought is among the boys themselves. The ones who get it, who understand the problem, exist. But so do the other kind, the ones who’ve drunk the koolaid of jihad and are drawn from a society that has lurched to the right. Ergo, it is no coincidence, perhaps, that just as the cause of jihad suffers a major public relations set back, the ‘Good Taliban’ raises its head to remind the people of the more popular role of militancy. Suspected militants shot and killed a paramilitary soldier and critically wounded another on Monday in a busy market in Srinagar, according to the police. The militants, armed with a pistol, shot the soldiers from the Central Industrial Security Force while they were buying vegetables at the market, a senior police officer said. The government has declared a 3 day mourning period for the innocent victims of Sunday’s suicide bombing. During this time, there will be much talk about how the attack was inhuman, unjustifiable, and against Islam. That talk will quickly turn to the cliched canard that, therefore, the attack could not be carried out by Muslims and it must be a conspiracy by some foreign agencies to undermine the peace talks and keep Pakistan divided against itself. The truth is that real problem is that Pakistan is divided against itself. We condemn some jihadis and make excuses for others. As long as we continue to embrace a state of denial about this reality, we can expect more and bloodier days to come. This entry was posted in Blogs and tagged conspriacy theories, Jamaat-i-Islami, kashmir, minorities, peace talks, Peshawar, suicide bombing, taliban, TTP by Sidra Jafri. Bookmark the permalink.